Hey, what's going on, guys? Adam here with americanmuscle.com. 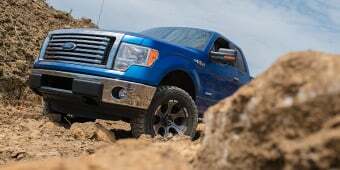 Today I'm bringing you a detailed review of the Raptor Series 5" Oval Wheel to Wheel Step Bar offered in your choice of either black e-coated or polished stainless steel like I have here today available for all '09 to '14 F-150s. So in this video, of course, I'll be going over the functionality and styling you can expect when picking up the wheel to wheel step bar from Raptor Series in the five-inch option and your choice of either the black e-coated or the polished stainless steel. I'll touch on the materials and construction as well as the installation, which I'll tell you upfront will get a solid one out of three wrenches on our difficulty meter, so let's jump right into it. 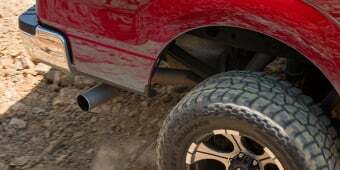 So the Raptor Series 5" Oval Wheel to Wheel Step Bar will be for all '09 to '14 F-150 owners out there looking to pick up one of the thicker options as far as step bars go on the market. And your choice of either a clean, attractive, polished stainless steel or a sleek black e-coated finish to help you hop in and out of your truck in style. So the Raptor Series 5" Oval Wheel to Wheel Step Bar available in the polished stainless steel I have here today or either that black e-coated you can see on the website as well, offers a very aggressive and sleek look to the side profile of your F-150 with one of the thicker tubing options in the five-inch, I'll touch on the materials a bit later though. 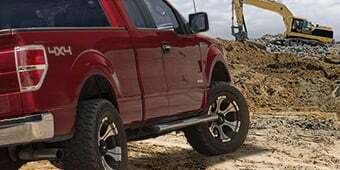 Now, this one obviously gives you the functionality of a step bar helping you hop in and out of your truck, especially beneficial to those lifted truck guys out there or use in a daily work and wanna gain access to their truck's bed, you have that extra step here as well with the wheel to wheel style design. Now, obviously, this one is manufactured out of a five-inch stainless steel tubing for a durable and long-lasting lifetime. And oval shaped throughout the entire extended wheel to wheel design here with no bends on the ends, unlike some of the other options on the market. 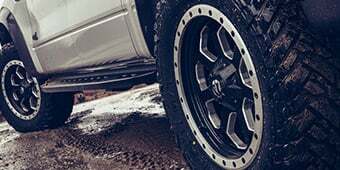 They offer three very slip-resistant gripping pads for long, all-year-round usage in any weather condition here with a very nice tire tread-like pattern similar to something of an off-road design. This one, of course, finished in that polished stainless steel attractive mirror-like shine. And also, like I said 100 times here, that black e-coat you can see on the site as well to fit either of your preferences. Now, before I jump into the pricing, I do wanna point out here that these are sometimes considered to be protection for the sides of your truck. But I do wanna point out as well I wouldn't necessarily consider them to be full on armor. Now these, of course, will protect you from small trail hazards if you're off-roading and even door dings in the parking lot. But if you're attacking some of those bigger trail hazards and rocks out there, this one might not hold up as well as some of the other options on the market. But if that is something that you're looking for, that side armor and extra protection, you might wanna check out some of the other options out there. Now price wise, if you are interested in the Raptor Series 5" Oval Wheel to Wheel Step Bar for that extra stepping pad to help you get into your truck's bed, you can pick up the black e-coated option for about 400 bucks. The stainless steel polished option I have here today for about 500 bucks. Definitely either one available to fit some of your preferences out there if this is something that you're looking for. Now, obviously, the price will shift a bit depending on if you have a SuperCrew or a Regular Cab, but either way, it will stay in that general pricing range. Now shifting gears over to the installation portion of the video, like I said in the very beginning, this one is gonna be a very simple one out of three wrenches on our difficulty meter. Will be a direct bolt-on, no drilling, no modifications required to get the job done and all you'll need tool wise is a simple ratchet and a socket set. So to kick things off, you'll be mounting the brackets provided for you in the kit onto your preexisting mounting studs already located on the interior wall of your rocker panel. Once those brackets are installed, using the hardware provided, repeat it for each of the brackets provided for you, then we can move on to installing your actual step bar. From here you can pick up one of your side steps and the rubber gaskets, place them over the brackets you just installed on the one side of the vehicle. Tighten them down by hand using the hardware provided, but not overly tightened just yet. Once you get both side steps on both sides of the vehicle leveled properly you can tighten them down to spec at 15 to 20 foot pounds. 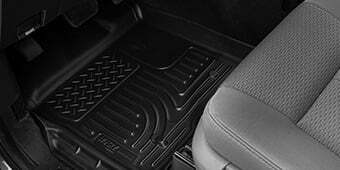 So overall, like I said here, a very common side step installation will take about one to two hours in the driveway at home with some very common hand tools like that ratchet and simple socket set. I would definitely be giving this one a one out of three wrenches on our difficulty meter. The direct bolt-on's something anybody can do with just a little bit of time in their driveway. 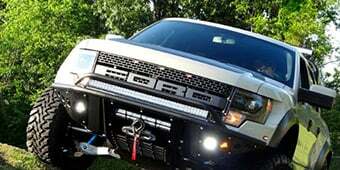 Well, guys, just to wrap things up here, if you're the owner of an '09 to '14 F-150 and you're looking for one of the thicker options as far as step bars go, but maybe not the thickest, but you also might want that stepping pad to help you get into your truck's bed a little easier, then you might wanna check out the Raptor Series 5" Oval Wheel to Wheel Step Bar, available in your choice of either the black e-coated or the polished stainless steel you see here on the table with me. Which are both available right here at americanmuscle.com. Functional Style. 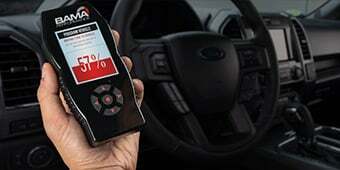 Get the step up you need without sacrificing style by investing in the Raptor Series 5 in. Oval Wheel to Wheel Side Step Bars in Black. These Side Steps feature a full, wheel to wheel design to put steps right where you need them, including an additional step pad right in front of your rear tire for easy cargo and tool box access. Each step is designed to handle up to 500 lbs. 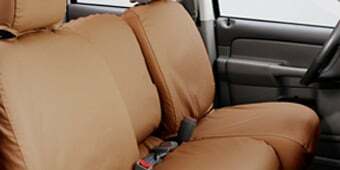 and are perfect for assisting you or your passengers in and out your truck's cab. These F-150 Steps are finished in a tough black E-coat that will easily complement your factory or aftermarket upgrades for exceptional style and function. Durable Construction. Each side step is finished in a tough, black E-coating to ensure reliable corrosion resistance throughout the seasons. High impact ABS end caps are applied to create a more streamlined step and clean appearance. Easy Installation. These Black Side Steps mount to your F-150's existing factory locations. 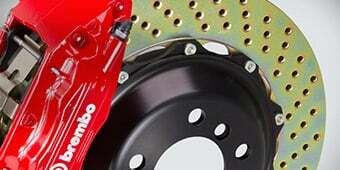 No drilling or modification is required and all the necessary hardware is included for a quick and painless upgrade. 10 Year Warranty. These Black E-Coated Side Steps are backed by an industry leading 10 Year Limited Warranty to ensure quality craftsmanship and materials. Some exclusions may apply, please see manufacturer's warranty for complete details. Application. These Raptor Series 5 in. 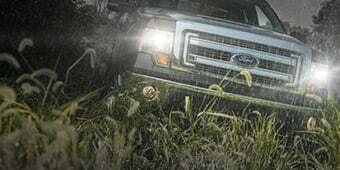 Oval Wheel to Wheel Side Step Bars are designed to fit 2004 to 2014 Ford F-150s with the following cab and bed sizes.